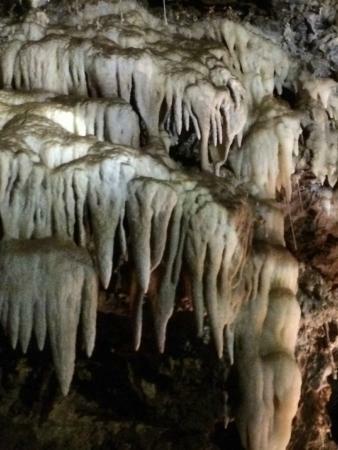 We just completed our trip to California Caverns where we got to explore several rooms full of speleothems! At one point, we were 150 feet underground in the coolness of 53˚ temperatures. We got to experience complete darkness and lighting from the Gold Rush era. We were surrounded by calcite and limestone, which we have studied in class. We squeezed through tight spaces, and saw things that could only exist under the ground. Hopefully, everyone found some great gems during their gemstone mining time, too. What was it like for you there? What was something that amazed you? Was there something that you didn't like? These questions are just some ideas to get you started. You can write about anything you'd like about California Caverns. Create a post with a strong opening sentence to get your reader interested. Add some exceptional details and try to get your reader excited about California Caverns just by reading your blog. Remember to keep an eye on good spelling and conventions. Let's eliminate the run-ons! Get descriptive, add good thoughts, and teach people from all over the world about California Caverns!